It is possible to incorporate Coverity results in the TICS output for files. The results must be available in the Coverity Connect viewer. TICS only retrieves the results and does not perform the analysis. The Coverity properties have to be configured correctly, see below. To use Coverity one has to set-up the required properties in either the SERVER.txt to apply them for all projects or in PROJECTS.txt to apply them project specific. If the properties are declared in the SERVER file and also in the PROJECT the project specific properties will overwrite the global properties. 'SECURITY' => 'This property should be set (=1) when the Coverity installed has a full license that includes security analysis. This section will give a more detailed explanation to clarify how to define the 'BRANCHDIR' property and why it is needed. The screenshot below shows an actual live set-up where the BRANCHDIR is needed to get TICS to work with Coverity. Now for TICS to work with Coverity it is needed to translate the relative path of TICS to the absolute path of Coverity. As seen on the screenshot below the project name of the Coverity project is Maps QA. 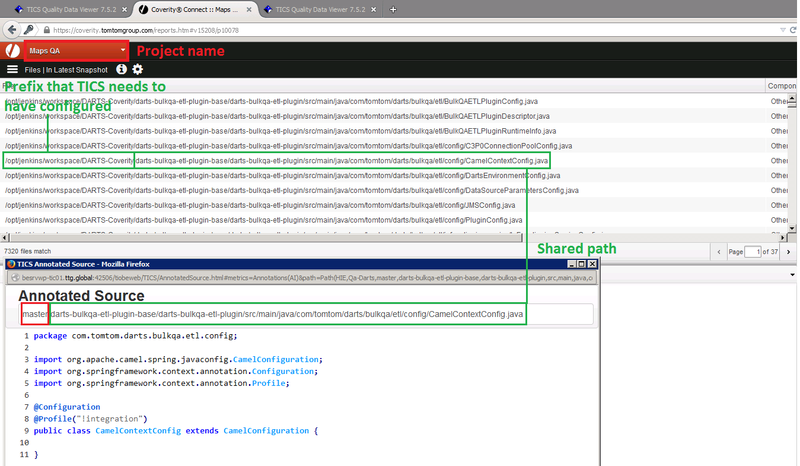 The prefix that is needed to translate the path is highlighted in the Coverity path (first green box). Note that the BRANCHNAME needs to be removed from the relative path of TICS.